Mix and put in pie dish. Makes one shell. Mix. (I heat it a bit to mix it easier) Add to pie shell. Freeze till firm. Fill with ice cream. And now I best get crackin’! 🙂 Happy Thursday!! Great! It should still taste good 🙂 Thanks for stopping by! Thanks for the recipe. 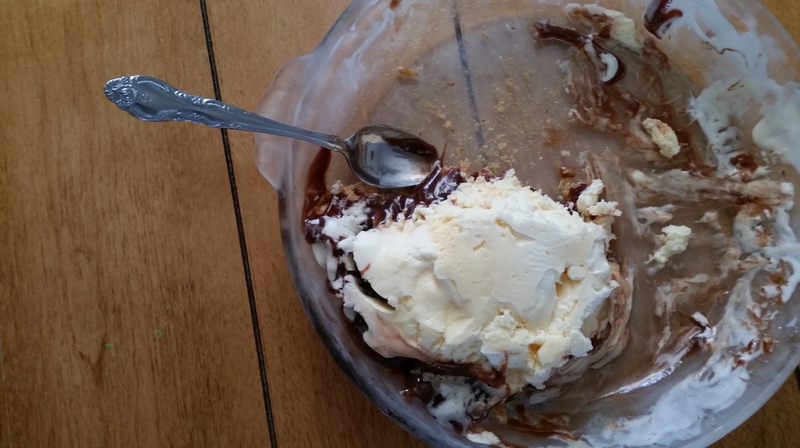 I’ve never made it with the hot fudge sauce… its currently in the freezer waiting for my family to devour it for supper. :)And I can’t imagine it ever being too cold for ice cream. No such thing. I hope you enjoy it, Rachel!